As you probably know, we have a team in Barcelona for Mobile World Congress 2013. And we have a booth! There (more precisely Booth #8.1H47 in the App Planet Hall), we're showcasing our Security Intelligence for Mobile Suite as well as demoing our unique, light, and powerful SecureAnywhere Endpoint and Mobile products. 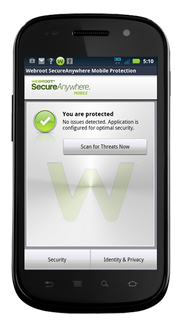 Why is mobile security so important? In an age where BYOD is ever-increasing in popularity at companies and with users shifting to mobile computing more than ever before, mobile threats are also rising (and more importantly adapting) quickly. Because of this, IT admins are finding it harder and harder to maintain control of sensitive company data. In a recent Webroot survey, we found that a truly alarming 82% of participants think mobile devices are risky business in the corporate environment. Mobile malware is rampant and presents a real threat to both companies and their customers. That's where we step in. We recently launched our Security Intelligence for Mobile Suite and have since announced two strategic partnerships-with SOTI and FancyFon. Coupled with our powerful and fast cloud-based SecureAnywhere Business-Mobile Protection, we believe that we can change those 82% of participants' minds and let those IT admins regain control of their sensitive company data. If you're at MWC13, make sure to stop by our booth and see for yourself what we have to offer!